Microsoft have been pushing for cross-platform parity between their titles in the past few years, with major first-party Xbox games coming to PC alongside console versions. Unfortunately, their biggest series hasn’t yet seen the benefits of the initiative, with only the limited Halo 5: Forge bringing the Spartans to PC. But there’s a mod that seeks to change that, and it’s on the verge of a new update. Check in on the best FPS games on PC. 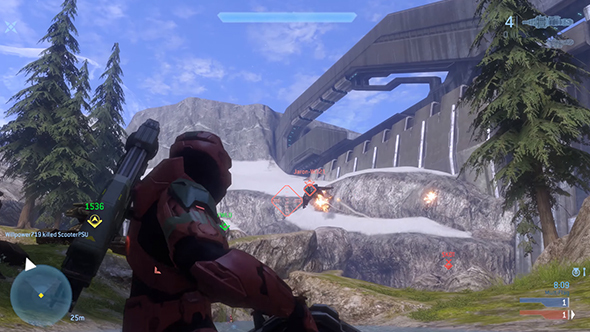 ElDewrito is a mod for Halo: Online, an ill-fated free-to-play Russian game based on Halo 3’s multiplayer. Though the official game is dead, the mod restores much of the original functionality with plenty of other improvements alongside. That includes server browsers, stat tracking, and servers for both ranked and social play. The modders had planned to move on to a different form of the project following the last major update to ElDewrito in 2016, but here we are two years later, and version 0.6 is set for release very soon. Check out the trailer above for a closer look – it’s definitely Halo on PC, which is reason enough for excitement. The update promises some gameplay improvements and vast expansion for Forge mode. ElDewrito 0.6 launches on April 20, and you can stay current on the latest updates with the Halo Online subreddit. Hopefully, the publicity of a new release means a healthy player count for the launch. The mod’s been around for years without too much scrutiny from Microsoft, so we can further hope to see a lengthy life for Halo on PC. Who knows, maybe one of these days it’ll be official again.